In 926 the Britons inhabiting Exeter were driven into Cornwall by Athelstan, who fixed the River Tamar as their boundary. When he returned to Exeter from his campaign he set about removing the old fortifications, of huge bulwarks of earth, strengthened by stakes, and surrounded by ditches. He rebuilt the stone wall measuring one and a half miles in circuit, and constructed towers, with a deep and regular fosse. 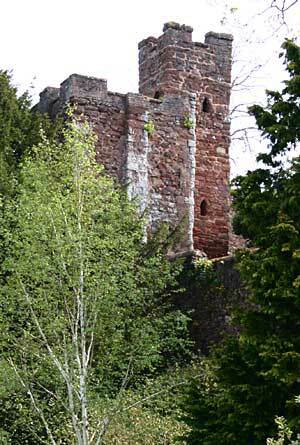 Athelstan also built a castle on the highest ground inside the wall, on the Red Mount, now known as the Norman, Rougemont Castle. It is thought that the only part of his castle to survive is a part of the ruins known as "Athelstan's Tower". The tower has triangular windows, a Saxon architectural feature, which are probably early Norman while the crenellated battlements are later. The gatehouse of Rougemont Castle also has Saxon style, triangular windows dating from the Norman build when some Saxon techniques were used by local builders. The tower is constructed from a mix of stone, some recycled, including the volcanic stone favoured by the Romans as a building material. The path leading up to the tower is nineteenth-century in origin. The tower is the highest point in the city and commands a fine view over Northernhay Park and across the Longbrook Valley. The custom of having a trumpeter play from the tower, for the Remembrance Day service at the Exeter War Memorial, on the 11th November each year has been discontinued. It was Athelstan who changed the name of the town from Monkton to Exancaester, the root of Exeter, in 940. He also established two mints in Exeter, where Saxon silver coins were struck. Source: Exeter by Sidney Heath and Civil and Ecclesiastical History of the City of Exeter and its Environs by Alexander Jenkins. Athelstan's Tower overlooks Northernhay Park.